Mother: only one word, so many meanings. Whether you are a working mum or a stay-at-home mum, your jobs and tasks are endless and don’t lack in variety. Caregivers, cooks, cleaners, psychologists, chauffeurs, doctors, managers, hairdressers, dieticians, accountants, teachers, waitresses, maids and nurses are just few of the roles we take on daily. There just aren’t enough hours in the day, we just don’t have enough arms to handle all the things we have to do. However, what we mastered is improvisation and lateral thinking, so let’s put that multitasking brain of ours to work, and figure out how to keep our sanity! Our lives change so much when we become mums. More than we ever thought possible. I choose to keep the positive side of motherhood and try to look upon its numerous difficulties with a smile and lots of love. We, indeed, should go for love and NOT for perfect. Alongside this magical life discovery journey of motherhood, we have the absolute right to get as much help as possible and fill our busy heads with clever tips and suggestions that could make things a bit easier. In previous articles, we set some basic ‘parental’ rules, talked practical organizing, discussed some smart points when it comes to meal planning and found ways to finally sort out our children’s ‘clothes’ situation! One of the ‘hottest’ and most challenging subjects in a family home is the chore distribution and its general cleaning arrangements. Children, naturally, prefer to avoid the whole ‘tidying up’ topic altogether and who can blame them? However, like most habits, helping mom clean the house and eventually being tidy adults can be learned and become a way of life. 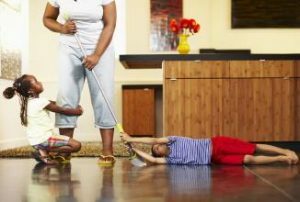 When cleaning the house becomes a fun activity with mum and dad then children quickly learn to adapt to it and be willing to take part in this family bonding time. Here are some tricks to help you make a start of it and help make your own life a tiny bit easier. Start of by making it simple. I totally understand moms who tell me that rather than engaging in full blown arguments and waste limited time, they prefer to just get over and done with it fast on their own. Although this might seem like the most mum-logical and practical way out of problems, it isn’t always what’s best for your children or you. If your children refuse to become involved in any kind of cleaning activity start with something small but make sure you stick to it and insist that it is done daily. Set a simple rule of cleaning up the table after every meal which is a great start to teaching them responsibility. Associate the completion of this task with allowed TV time, etc. Teach your children to be tidy from a young age. Children are capable of many things, if only we believe in them enough to motivate them towards the right direction. A two-year old toddler is more than capable of helping you change the bed sheets, the laundry and basic dusting. The point is not for them to do it well or even like you, rather than just taking part and learning. Have a family meeting to distribute household chores. Gather all the family members and discuss what kind of cleaning everyone can do. 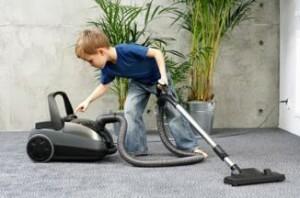 Depending on their age, children can easily be a lot of help around the house. Offer suggestions and motivate them into choosing things that they can do. Under no circumstances don’t tolerate talk such as this: ‘housework is only for girls’, ‘I can’t do nothing’, or ‘I don’t mind being untidy’. Set deadlines. Explain to your children that they have to complete the jobs they are responsible for, before going out with friends in the afternoon, playing computer games etc. Be firm, regular and consistent; it will eventually become a habit and a family rule that you will all follow. Make it fun. Agree on a day where you will help clean the house, preferably in the weekend when everyone has more time and start the day in a very positive way. Put lively music on loud and start cleaning. Don’t forget to smile. Include the parents in the household chore list. If you create a list that will be hanging from the wall or the fridge with everyone’s cleaning responsibilities, don’t forget to include mum and dad (cooking, shopping etc). This way, your children will get a sense of equality sharing and of helping each other. Place a laundry basket in your children’s room. This is such an amazing idea. I recently did this and I can’t believe the change I saw in my two very young daughters. They feel very grown up, they love the responsibility of filling the baskets with their own clothes only and they feel very proud doing so. Sometimes, you might get clean clothes mixed with the dirty ones but it’s part of the fun. All wonderful moms around the world – relax!! Rome wasn’t built in a day and you cannot fit a 70 hour schedule in the same day either! I promise I will provide you with some very practical ideas and tips to make your parental life easier and you feeling more chilled out and loosen up. Till next time.